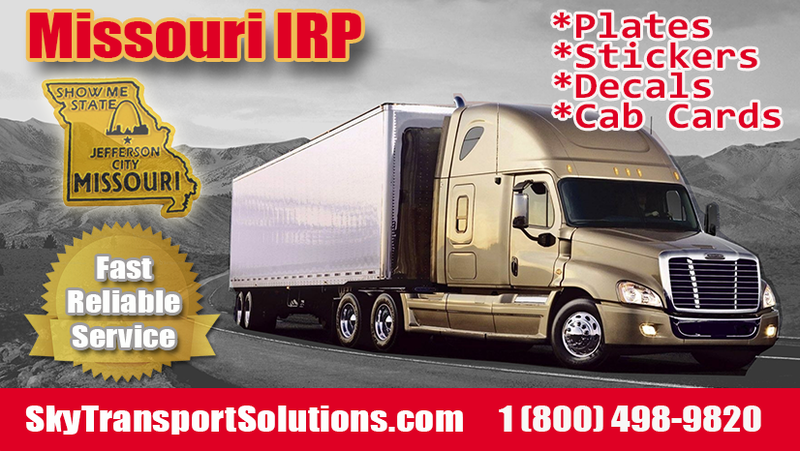 IRP Missouri - Get your trucks IRP Missouri fast. When you need to get IRP Missouri plates quickly and have all your questions answered call the experts at Sky Transport Solutions. Send us your Telephone Number and we will contact you and explain all our services and answer any questions you may have regarding IRP Missouri plates, stickers, decals and cab cards. We make sure you get your IRP Missouri stickers, decals and cab cards quickly. Missouri highways provide truckers the means to transport freight to warehouses, manufacturers and distribution centers. So check out whats the condition of major highways and roads in the state of Missouri. When you choose to work with Sky Transport Solutions you will receive professional and knowledgeable service. Our staff has worked with thousands of trucking companies and owner operators.